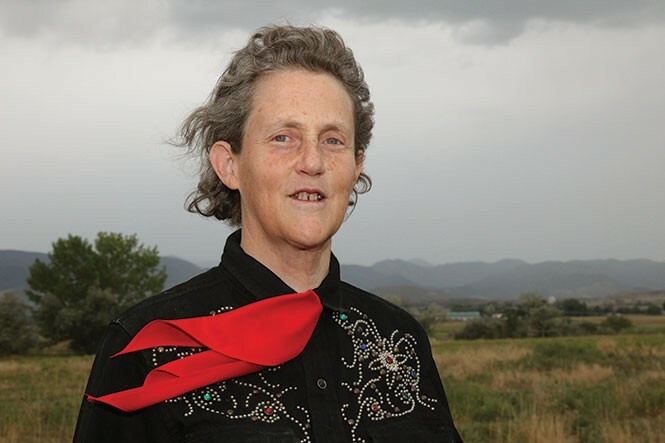 Temple Grandin wears several hats: autism educator, animal-rights advocate and accidental fashion icon. But prior to her speaking engagements, earning her Ph.D. in animal studies and having an HBO movie based on her life starring Claire Danes, she was an odd girl. One that was diagnosed with “brain damage” at age 2. Her mother, Anna, came upon the studies of Bernard Rimland with the Autism Research Institute early on, and did her best to tinge her daughter’s formative years with a sense of normalcy. Still, “normal” for Grandin meant being teased by her peers because of her unique speech pattern, but also being accepted and mentored by teachers who encouraged her to pursue her dream of becoming a scientist and livestock-equipment designer. Grandin has faced criticism within the autism community, with some calling her classist and ableist due to her distinctions between “high-functioning” and “low-functioning” autism. Still, as the “most accomplished and well-known adult with autism in the world,” according to her official bio, she stays the course and will be visiting Salt Lake City on Friday, April 1, to give a keynote address at a symposium titled The Bottom Line of Disabilities at the Columbus Community Center (3495 S. West Temple, ColumbusServes.org). In a chat with City Weekly, Grandin talked about her school experience, her personal philosophy and her big night at the Emmys. EL: Tell me a little bit about your Utah experience; I know you’ve been here a few times. TG: I’ve been up to the university and talked to students about cattle handling, I’ve talked to them about autism and I’ve also talked to people about different kinds of minds, similar to my TED Talk. Some people are visual thinkers, some people are math thinkers, some people are word thinkers. [Also,] my good friend Rosalie Winard is in Utah. Growing up in a time when autism wasn’t a household term, what was your school experience like? Well, the thing that saved me in high school was the specialized interests. You know, the kids that were interested in horses or model rockets or electronics were not the kids that did the teasing. I can’t emphasize this enough: If you have kids in school that are having trouble with bullying, get them involved in shared-interest activities—band, literary art, it can be lots of different things—because those places are going to be refuges away from the bullying. Where did your interest for animal activism originate? Well, being an extreme visual thinker helped me in my work with animals; but the thing I’ve done the most work with is improving the slaughter plants. When I first started out, I designed a lot of the systems for slaughter plants, and one of my biggest frustrations was getting people to operate equipment properly. People always want the thing more than they want the management; they want the magical thing. Then, in 1999, I worked on implementing the McDonald’s animal-welfare audits and the Wendy’s animal-welfare audits, and when I had the power of those big companies behind me, boy did we make some changes. What were some of those changes? The first thing we had to do was fix all the broken equipment they had. [Adding] non-slip flooring, changing the lighting because animals—people always ask me if they know they’re gonna get slaughtered—well, they behave the same way at the slaughterhouse that they behave at the feed yard. They’re more concerned that it’s too dark and they don't want to go into the dark chute entrance because that’s scary. It worked because the requirements were very clear, like traffic rules are clear. You talk about people being more interested in “the thing.” In this case, what is that? Slaughtering the animal? Well, the thing would be designing a really fancy cow-handling facility. It’s similar how in California they thought that if you put iPads in every school, it’s gonna make the schools wonderful. That did not make the schools wonderful. That does not replace good teaching. People always want the thing more than they want the management that needs to go with the thing. And I don’t care what field you’re in, that’s true for every field. Moving toward the other side of your activism work, currently, some self-advocacy groups have pushed for changing April’s designation as Autism Awareness Month to Autism Acceptance Month. What are your thoughts on this? Well, I think it’s a very good idea. I just heard about that now. Are you surprised by the attention autism has gotten in the past few years? Well, more and more kids are getting diagnosed with it. That’s one of the reasons why it’s getting all the attention. Autism ranges from half of the people that program computers in Silicon Valley, the famous scientists and musicians, to somebody that remains nonverbal with very severe handicaps. But when the kids are little—like, I was very severe when I was a little kid—at 3 years old, you can take two kids that look really, really severe, and one of them with very early therapy, you can pull ’em out of it, that’s me. And then you got another one that remains nonverbal, and some of those nonverbal kids have normal intelligence, but they have a very difficult time controlling their movements. It’s very, very variable. Along with your advocacy work, one of the first things I think of when hearing your name is your scene-stealing moments during the 2010 awards-season circuit. What was it like having all that attention when that TV movie based on your life came out? It’s a responsibility. I get a lot of letters from little kids writing to me. They look up to me, and that’s why I’ve got to always be on good behavior. It was very exciting at the Emmys, because you don't know who’s gonna win; nobody knows. The committee casts their ballots, they put ’em in these little cardboard cards that are taped shut, the card is handed to the host and then nobody knows until the card is ripped open. So, it’s real exciting, and then, of course, I stood up when it won something. Another image that comes to mind is your fashion sense. How do you respond to being considered a fashion icon? Well, I make a point of getting lots of different kinds of shirts, a certain type of tie and fancy Western shirts, and sometimes people give them to me. I got a beautiful yellow Western shirt when I did a conference in Austin, but it was too small. I loved it! It was a beautiful shirt with the yellow roses of Texas. I would have just taken off the shirt I had on—and I do wear another shirt under them. I was gonna say to be careful and not give them a show. [Laughs] No, I wear a T-shirt under ’em.